This video describes the Amine Analysis. This analysis calculates H2S, CO2, and total loadings for rich and lean amine streams. Stream pH and Molarity are also calculated. This video demonstrates the initial design of an Amine Sweetening unit. ProMax allows you to compare different operating conditions for different solvents to optimize design. This video illustrates how to use AutoKinetic® Reactors within ProMax. A Naphtha Hydrotreater example is used for this demonstration. This video illustrates the process of back blending, a method used to estimate inlet conditions for a production facility. This is often used for estimating emissions off hydrocarbon tanks and water tanks. This video illustrates the most common specifications utilized around different equipment blocks within ProMax. 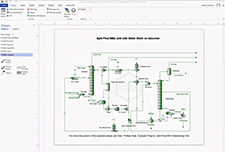 This exercise is designed to give hands-on experience with the Visio drawing interface as ProMax uses it, and an introduction to making specifications within ProMax. 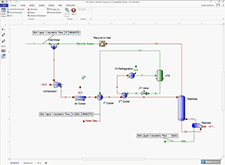 An example is shown from the ProMax Examples folder to present a solved amine sweetening unit simulation. Emphasis is given to the tray internal information required to utilize the TSWEET Kinetics rate-based model. Want to combine two ProMax projects? This tutorial shows you how. This video uses a simple sour water stripper system to demonstrate how to make specifications within ProMax. It is best to watch BRE 101 – Sour Water Stripper before watching this video. This video continues the simple sour water stripper demonstration. This video shows how to add customized variables (user values) in ProMax. This is demonstrated by calculating the glycol losses as a function of wet gas being conditioned through a TEG dehydration unit. This video illustrates the callout shape, which allows stream information to be displayed on the flowsheet. Tips on customizing the display layout and copying data to Excel are also provided. This video illustrates how to use Cn+ Flow/Frac stencil within ProMax. This stencil is used to add up all hydrocarbons with a user-specified minimum number of carbons in them. This video demonstrates tips for getting difficult columns to converge. The Convergence tab within a column is discussed as well as what column specifications are easiest to solve. This video illustrates the ProMax column sizing features. Towers can be sized using trays or packing. Existing tower internals may be input, or the required diameter may be calculated for design cases. This video illustrates the Combustion analysis. This analysis provides additional calculations including the required oxygen for combustion, heating values on multiple basis, and stream energy content. This video illustrates how to use the Component GPM stencil in ProMax. This will display the GPM (gallons per million standard cubic feet) of an individual component within a stream. This video illustrates how to use the Composition Subset Analysis available in ProMax 4.0. This analysis allows the user to quickly sum up any desired group of components. This video illustrates the Control Valve analysis. This analysis calculates valve Cv and pressure drop according to the selected valve type. The video also shows these calculations inside of a valve block. This video illustrates how to create multiple scenarios by copying an existing scenario and then adjusting the Excel sheet, cells, & ProMax objects referred to by the Scenario Tool. This video shows how to create an interactive Block Flow Diagram. It is particularly useful for projects with multiple processes. 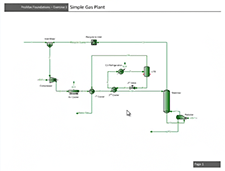 This demonstration is based on a complete state of the art gas processing plant. This video illustrates how to select which components will be available within a ProMax Environment. The video provides tips on the easiest ways to add components and organize your component list. 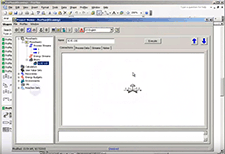 This video illustrates the use of the Cross Flowsheet Connector shape, which allows for stream information to be passed from one flowsheet to another. This video illustrates the Curve Oil feature within ProMax. Curve Oils can be used to define any oil cut by using its boiling point curve. A crude oil example is demonstrated in this video. This video describes how to perform the ASTM D6377 standard to calculate vapor pressure of a crude oil. The video also shows how to convert this vapor pressure into a Reid Vapor Pressure equivalent. This video illustrates how to use the Date Example stencil within ProMax. This stencil can display the date a file was created, saved, modified, and/or converged. 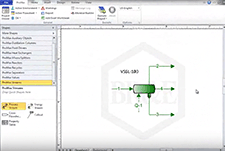 This video illustrates how to use the Depressurization Example stencil. The video describes the different cases and calculations available and demonstrates its use for two different cases. This video demonstrates the Phase Envelope Property Stencil, which allows you to display a phase envelope on a ProMax flowsheet. This video illustrates the Distillation Curves analysis within ProMax streams. This analysis can generate the following boiling curve types: TBP, ASTM D86, ASTM D1160, ASTM D2887/SD, and EFV. This video illustrates how to use the Elemental Flow Example stencil. This stencil allows you to sum the flow rate of a particular element inside a stream, such as the amount of Sulfur going into an SRU. This video illustrates how to use the Import/Export features between Excel and ProMax. Information can be imported from Excel into ProMax, and ProMax calculations can be exported into Excel for reporting. This video illustrates the Differential Pressure Flow Meter analysis. This analysis allows us to calculate pressure drop across different flow meters, including orifice, nozzle, and venturi meters. This video illustrates the Freeze Out, Hydrate, H2O Dew Point analysis. This analysis calculates water content as well as solids formation temperatures for three types of solids: Hydrates, Ice, and Dry Ice. This video illustrates the Fuel Properties analysis. This analysis calculates fuel properties such as ASTM D93 flash point, research octane number, and ASTM D86 cut points. This video illustrates Gibbs Minimization reactors. The concept of Gibbs Minimization is discussed and an example of its use within sulfur recovery units is demonstrated. This video demonstrates how to calculate Global Warming Potential using ProMax. This video demonstrates how to rate and size a heat exchanger in ProMax®. 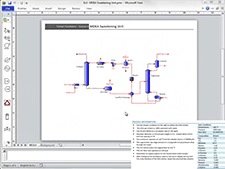 You will learn how to use a solver to determine the length your heat exchanger needs to be. 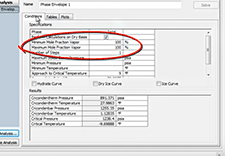 This video illustrates the Heat Transfer Example stencil, which allows the user to display heat exchanger supply & demand curves on a ProMax flowsheet. This video demonstrates how to setup a heat transfer fluid loop. In the video, a heat transfer fluid is used to run an amine reboiler loop. A list of all the available heat transfer fluids is also provided. This video illustrates how to use the Inline Flow Multiplier within ProMax. This stencil allows the user to multiply the flow rate of a given stream. This video illustrates the Ionic Info analysis that can be performed within ProMax streams. This analysis calculates pH, ionic concentrations, and salt compositions within a stream. This video illustrates the Line Sizing analysis. This analysis calculates the necessary pipe size to keep the pressure drop and/or velocity below a user-defined limit. Erosional Velocity may also be calculated. This video demonstrates how to setup a column using mass transfer modelling in ProMax 4.0. This video illustrates useful tips for solving multi-stage chillers. A solver to find the actual refrigerant flow required is created followed by a discussion on solver algorithms and solver scripting. This video illustrates the OOOOa Vent Assessment Tool within ProMax. This tool can be used to analyze closed vent systems according to OOOOa guidelines. 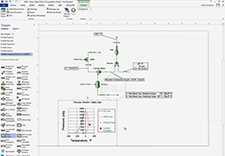 This video illustrates how to display a Pressure vs. Enthalpy diagram on your flowsheet using the P-H Diagram Example stencil. This video illustrates the Phase Envelope analysis. This analysis can generate a phase envelope plot with the option to add hydrate, ice, or dry ice curves. The critical pressure and temperature are also calculated. This video describes the Pipeline Mach Example stencil, used to calculate Mach numbers through pipelines. The video also demonstrates how this stencil can calculate "choked" flow through a pipe. This video uses a simple pipeline network to demonstrate how to use ProMax solvers and specifiers to achieve a desired pressure at the network outlet while equalizing pressures at nodes. This video demonstrates how to specify heat exchangers in ProMax. 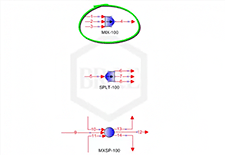 This video illustrates how to use the Oil Speciation block within ProMax. This block is used to convert a crude assay into composition data. This video illustrates the pipeline block. The pipeline block can account for fittings, elevation changes, reducers, etc. Insulation can be included and heat transfer to the surroundings can be calculated. This tutorial discusses the usage of recycle blocks in ProMax. There are three uses discussed: property stream recycles, energy stream recycles and closed loop propagation. This video illustrates the use and capabilities of the Saturator block within ProMax. 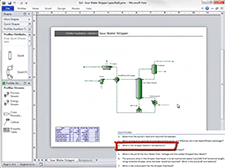 This tutorial explains how to model a separator. This tutorial covers the basics of JT valve blocks within ProMax. Valve block parameters as well as some of the details for specifying and using the JT valve block are discussed. This video illustrates the ProMax Help files, which provide a database of definitions, diagrams, and recommendations for common processes. This video illustrates the ProMax makeup block. The makeup block is used in solvent loop applications to achieve a desired flow rate and/or composition in circulation. This video explains the ProMax Project Options. This includes changing project wide properties (such as atmospheric pressure) and changing what properties are displayed in the Project Viewer. This video illustrates how to calculate component recoveries. Ethane recovery and sulfur recovery are both demonstrated. This video illustrates the different methods for generating a ProMax report. ProMax reporting allows for customization of reported data and formatting to report what you want, how you want it. This video uses a Sour Water Stripper to demonstrate how to use a ProMax solver. It also shows how to achieve your SWS stripped water specification using sulfuric acid. This video illustrates the Property Calculator stencil, which is used to perform calculations directly on the flowsheet. This video demonstrates how to use the Property Input Stencil. This stencil is used to be able to edit a property directly on the flowsheet instead of going into the Project Viewer to make changes. This video illustrates the property table shape, which allows the user to display information about multiple streams or blocks side-by-side on the flowsheet. Different table layouts are demonstrated. This video illustrates how to model refrigeration loops. 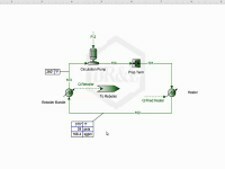 The Propagation Terminal block is demonstrated in a simple propane loop model, with discussion on which parameters to specify. This video illustrates the Relief Valve Sizing analysis in ProMax. This analysis calculates the required orifice area for a given flow at relief conditions, following API 520 or other international standards. This video covers the concepts of rich & lean approaches for an amine absorber. Their definitions and uses are explained, followed by a demonstration of how to perform the calculations. This video demonstrates the Salt Example stencil, which is used to quickly create a salt water stream by setting the desired mass fraction of salt in the water. This video describes the 2D Grid Setup Tool, used to quickly setup a Scenario Tool grid with two input variables and one output variable. This video illustrates the EZ Setup Tool feature, a shortcut for the Scenario Tool. This tool allows the user to specify variables and ranges and ProMax then generates the desired Excel table for the user. This video introduces the basics of the ProMax Scenario Tool, including how to add the Scenario Tool add-in into Excel. This video illustrates how to use JScript within ProMax Solvers & Specifiers. This scripting includes if/else statements and Math functions for more complex calculations. 3 examples are demonstrated. This video illustrates how to choose a thermodynamic property package for a ProMax environment. This video demonstrates how to size a separator vessel using ProMax. This video illustrates how to create Short Monikers in ProMax. Short Monikers allow the user to create shortcut paths to properties that they can then use in calculators or can display on the flowsheet. This video illustrates how to create Simple Specifiers inside of ProMax for additional automation and control. Do you need to calculate your emissions from an atmospheric tank? This video shows how to predict and report VOCs, BTEX, HAPs, and Greenhouse Gas emissions from an atmospheric tank using ProMax. This video illustrates how to use the Single Line Property Stencil within ProMax. This stencil is an alternative way the user can display a property on the flowsheet. This video illustrates how to create Single Oils to represent pseudo components within ProMax. This video illustrates the Solver Summary found within the Project Viewer. This summary displays all the solvers/recycles in the project in a single list to give the user easy access to solver properties. This video demonstrates ways to help organize blocks & streams on the flowsheet. This includes how to make stream lines straight, flip blocks horizontally or vertically, and align multiple blocks. This video illustrates how to use the Stream Component Ratio Stencil within ProMax. This stencil allows you to display component ratios on the flowsheet. This video illustrates how to use the Stream's Cn+ GPM property stencil within ProMax. This stencil will quickly display the GPM of Cn+ hydrocarbons within a stream (C2+, C3+, etc). This video illustrates how to use the Sum Components stencil to sum up groups of components. Note that in ProMax 4.0, this ability is available in the new "Component Subset" analysis. This video illustrates how to use the Sum I-O stencil within ProMax. 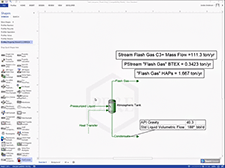 This stencil allows the user to quickly sum any property for all inlet or outlet streams on a flowsheet. 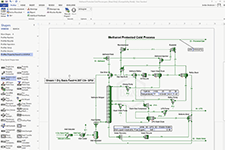 This video shows how to calculate and report tank emissions using a ProMax process simulation model. These emissions include Working/Breathing losses, Loading losses, and Flashing losses. 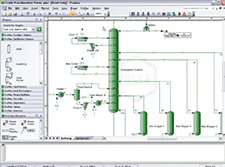 ProMax allows a user to create their own variables or properties within the simulation. This video shows how to create a User Value to represent ambient temperature. This video describes the Vapor Pressure analysis. This analysis calculates dew point and bubble point information, true vapor pressure, and Reid vapor pressure (where applicable). This video gives a few examples of how VBA coding could be used with ProMax. VBA can be used to optimize and automate projects as well as to use ProMax capabilities from within Excel. Introducing ProMax 4.0! This video explains new capabilities and improved features found within our latest version of the ProMax software.